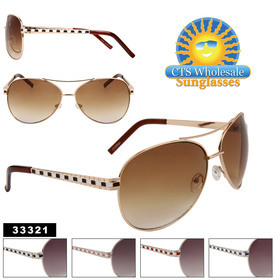 Hottest Selling Aviators for 2014 - CTS Wholesale LLC. High Fashion Aviators are going to be in high demand, predicted to be the Hottest Selling Aviators for 2014. As we all know, classic aviators are all time favorites, across the board best sellers. It's really no wonder why, with a timeless design and universal appeal, aviators are just plain cool. For 2014, we're going to see some subtle enhancements to these superior shades, worthy of high fashion while still maintaining the integrity of a classic aviator style. So, with no further ado, lets take a closer look at these smoking hot sunglasses. 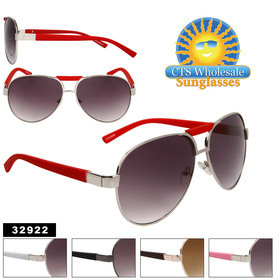 In the above shown aviators, you'll notice a nice variety, with several adhering closely to the classic style. Tear-drop shaped lenses, sweat bar and adjustable nose pads. All of these are sold by the dozen, and come packaged in a free display box. Style # 32524 features a faux leather covered temple, with color coordinated wire frames surrounding the classic lens shape. While Style # 33321 features an alternating color pattern along the temples, and comes with several frame colors that compliment the pattern along the temple. Style # DE587 features a somewhat squared lens shape, while still sporting a sweat bar and nose pads. with a pin stripe accenting the temple, as well as a DE™ logo. This model comes with five different colors. Style # 32922 boasts a unique temple in assorted colors, that features a textured pattern. 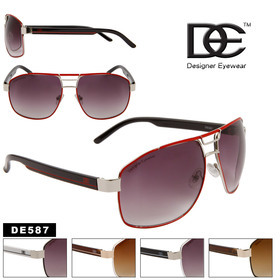 You can find these high fashion aviators in addition to our entire range here.